If there is one bird in the world that can lure even non-birders out to look for it, it’s the Snowy Owl (Bubo scandiacus). This regal, enigmatic bird has enraptured even the earliest of civilisations, one of the best examples being their ancient depictions in cave paintings in Europe. From North America to Scandinavia to Russia, local inhabitants have incorporated these Arctic wanderers into their mythology and folklore, giving them many names, including “Ghost Owl”, “Tundra Ghost”, “Ookpik”, and “White Terror of the North”. In Romania it is said that the souls of repentant sinners fly to heaven as Snowy Owls. So why has the Snowy Owl captured people’s imagination so? Is it their ghost-white feathers and piercing yellow eyes? Their notorious hunting skills? Or perhaps their mysterious migration pattern? Snowy owls nest in the Arctic tundra of the northernmost stretches of Alaska, Canada, and Eurasia. The word ‘tundra’ comes from the Finnish word, ‘tunturi’ meaning ‘treeless plain’. It’s a stark and cold environment of vast swampy plains, often covered in snow or ice. Unlike most owls, Snowy Owls are diurnal and hunt at any time during the continuous daylight of an Arctic summer. Usually they hunt small rodents, especially tunnelling lemmings, which they can locate through the snow with exceptional hearing. During periodic lemming population booms, scientists estimate that a pair of Snowy Owls, with a brood of nine owlets (a female will lay 5 – 14 eggs), will eat as many as 2,600 lemmings from May to September. To survive the harsh climate, Snowy Owls have thick insulating feathers, making them North America’s heaviest owl. Yet they are still remarkably agile, so, although lemmings may be their preferred diet, they can also catch small birds in flight as well as squirrels, weasels, seabirds, rabbits, ducks, and other small creatures. John James Audubon (an American ornithologist, naturalist, and painter) reported seeing this remarkable owl sitting at the edge of an ice hole, where it waited for fish and caught them using its feet. Male Snowy Owls are barred with dark brown when they’re young and get whiter as they get older, whilst females keep some dark markings throughout their lives. One of the most remarkable characteristics of a male Snowy Owl is its amazing mating display. With large bold wingbeats and a lemming in his bill or talons, a male will ascend into the air. On the way back down he holds his wings in a V-shape, and on descending drops his prey on the ground. He then lands and makes himself as tall as possible, bowing his head and fanning out his tail as the female approaches. If competition arises, he will hold out his wings and stick out the feathers on his neck to intimidate the rival male. In winter (once chicks have fledged) Snowy Owls generally migrate; however, these journeys are varied and often unpredictable. Some North American Snowy Owls even remain in their summer breeding grounds year-round. Other North American owls show up in southeastern Canada, the upper Great Lakes states, and New England. Snowy Owls can be seen as far south as Texas and Florida in extreme years. In these areas they look for landscape resembling the Arctic tundra: open fields and marshes, beaches, large fields, and even airstrips. Because Snowy Owls nest in remote areas and have huge territories and such varied migration patterns, estimating their population size is quite a challenge. According to the International Snowy Owl Working Group, there are far fewer Snowy Owls than were originally estimated, about 14,000 pairs rather than 300,000 individuals, and the numbers are declining. 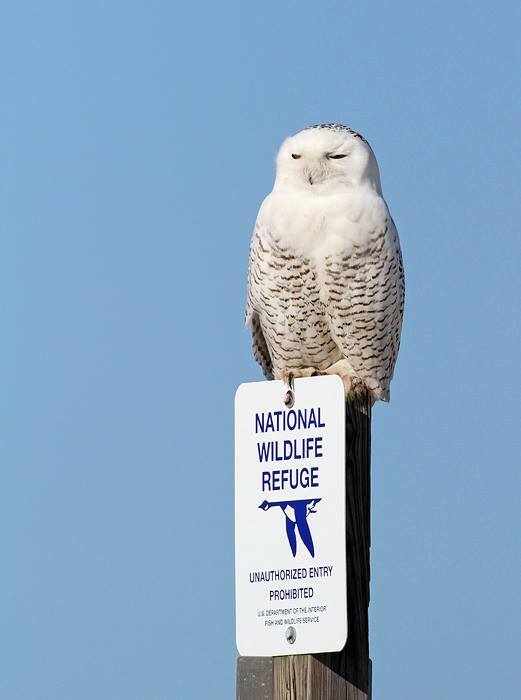 One of the major concerns of the future of the Snowy Owl and the tundra ecosystem is climate change. Even a slight rise in temperature or partial thawing of the permafrost could lead to thicker vegetation, which will make it more difficult for Snowy Owls to catch lemmings. Snowy Owls are truly magnificent birds, the highlight of a birding tour for sure! 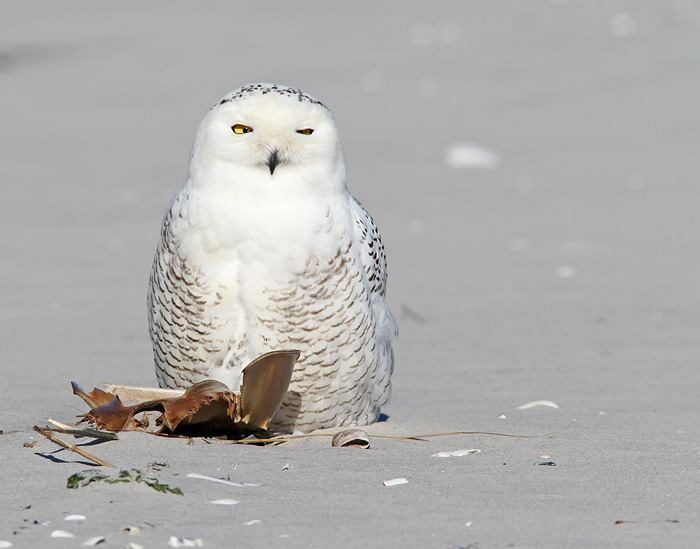 How to see a Snowy Owl? You’re come to the right place because Owls are some of our favourite birds at Birding Ecotours! In fact, we have special owling tours! Enquire about our Owls of the World tours to tailor make an option that suits you, or join one of our 7 or 12 day Birding Tours to Finland or our Owls and Other Winter Birds of Minnesota Tour in January 2019 for a good chance to see this magnificent owl. Sources: Living Bird Magazine , Massachusetts Audubon, Blue Planet Biomes, National Geographic.